Recognized for extraordinary dedication to making a difference in the lives of all San Franciscans. I had the pleasure of producing and creating a visual story for the award winners, spending a day with each Hero to learn and document more about their positive impact in our community. The video is a behind the scenes look at the ceremony and presentation of the content, visuals produced and executed for the San Francisco General Hospital Foundation and 2016 Heroes & Hearts Luncheon at AT&T Park. 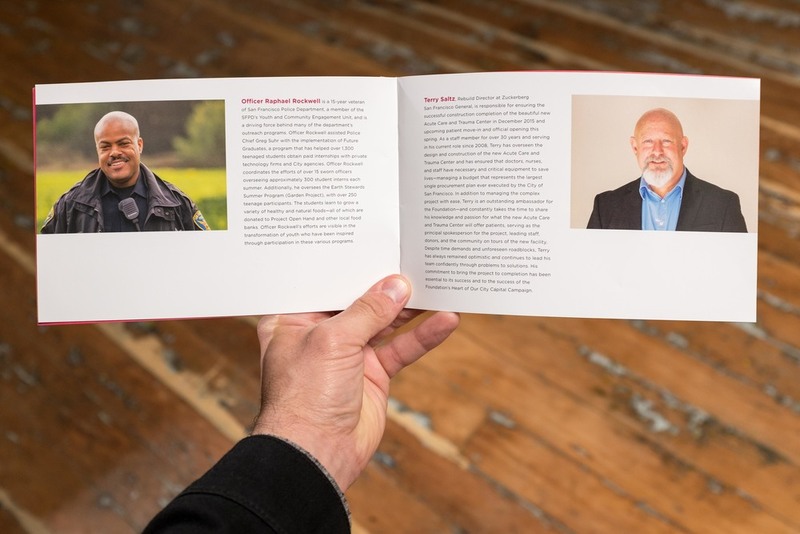 Continue below to see the selected content which appeared internally for the foundation, in printed programs at the event and online for the fundraising efforts. Clement Yeh began working at Zuckerberg San Francisco General in 2002 as a resident in the Emergency Department after attending Stanford University. He joined the faculty at UCSF, woking full time at Zuckerberg San Francisco General. As the City's only Trauma Center, the hospital serves as the Emergency Medial Services Base Hospital, allowing Dr. Yeh to invest in his interest in pre-hospital care, working closely with San Francisco Fire Department Paramedics and Emergency Medical Technicians. After working on various projects to improve the 911 systems, Dr. Yeh become the Medical Director for the Department of Emergency Management 911 Communications Center and in 2012, began serving as the San Francisco Fire Department Medical Director. As part of extending and improving the safety net of emergency care in the City, he has been involved in a joint project between the SFFD and the Department of Public Health that will help to improve the heath of some of San Francisco's most vulnerable patients. 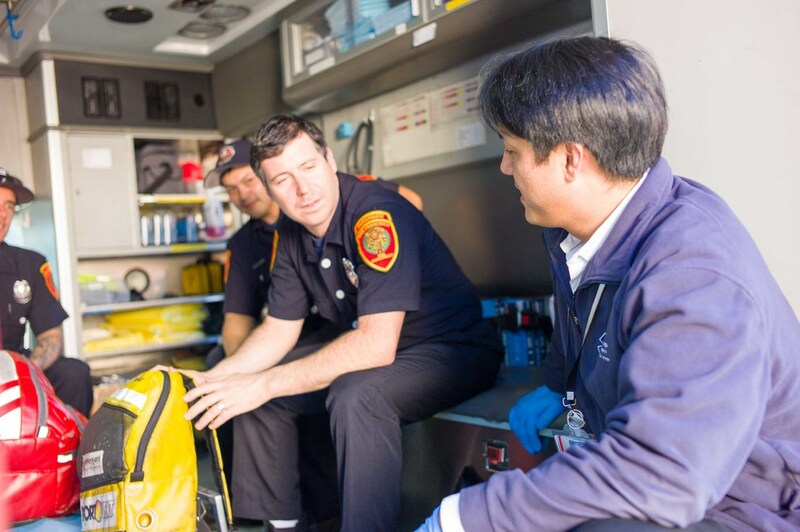 This program, called EMS-6, was created to meet the needs of people in San Francisco who depend on the emergency care system for almost all of their health needs by working to help avoid medical emergencies. 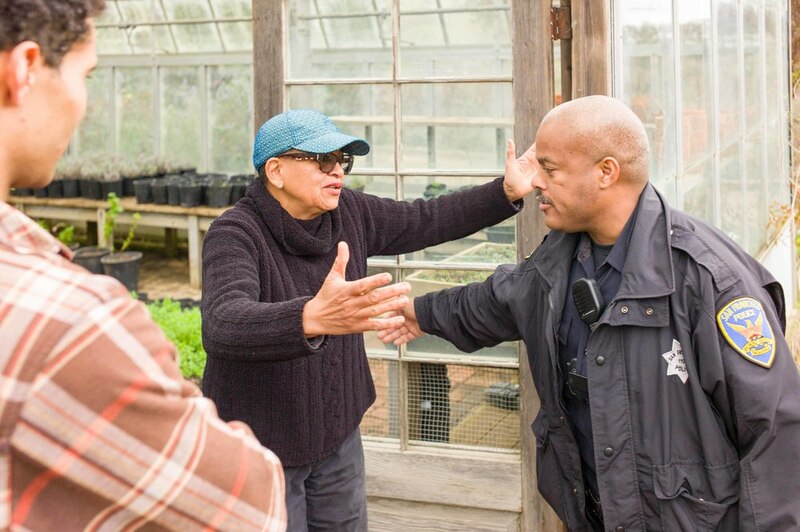 Officer Raphael Rockwell is a 15-year veteran of the San Francisco Police Department, a member of the SFPDs Youth and Community Engagement Unit, and is a driving force behind many of the department's outreach programs. Office Rockwell assisted Police Chief Greg Suhr with the implementation of Future Graduates, a program that has helped over 1,300 teenaged students obtain paid internships with private technology firms and City agencies. Officer Rockwell coordinates the efforts over 15 sworn officers overseeing approximately 300 student interns each summers. Additionally, he oversees the Earth Stewards Summer Program (Garden Project), with over 250 teenage participants. The students learn to grow a variety of healthy and naturals foods - all of which are donated to Project Open Hand and other local food banks. Office Rockwell's efforts are visible in the transformation of youth who have been inspired through participation in these various programs. 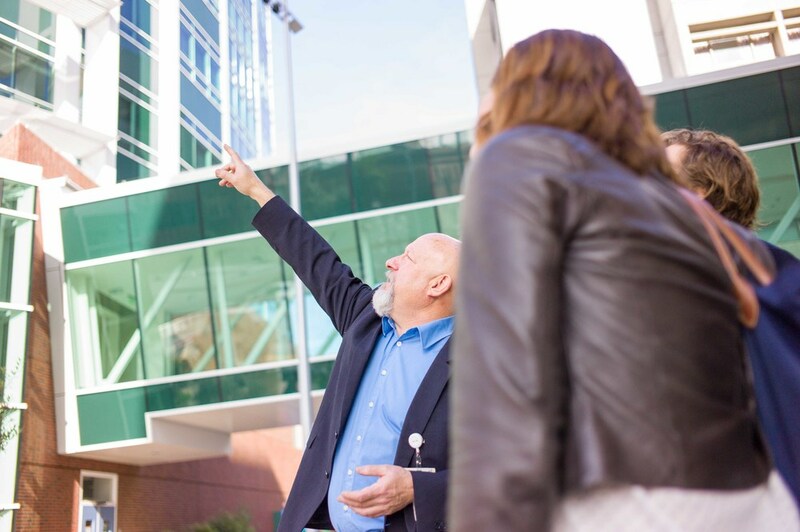 Terry Saltz, Rebuild Director at Zuckerberg San Francisco General, is responsible for ensuring the successful construction completion of the beautiful new Acute Care and Trauma Center in December 2015 and upcoming patient move-in and official opening this spring. As a staff member for over 30 years and serving in his current role since 2008, Terry has overseen the design and construction of the new Acute Care and Trauma Center and has ensured that doctors, nurses and staff have necessary and critical equipment to save lives - managing a budget that represents the largest single procurement plan ever executed by the City of San Francisco. In addition to managing the complex project with ease, Terry is an outstanding ambassador for the Foundation - and constantly takes the time to share his knowledge and passion for what the new Acute Care and Trauma Center will offer patients, serving as the principal spokesperson for the project, leading staff, donors, and the community on tours of the new facility. Despite time demands and unforeseen roadblocks, Terry has always remained optimistic and continues to lead his team confidently through problems to solutions. His commitment to bring the project to completion has been essential to its success and to the success of the foundation's Heart of Our City Capital Campaign. Dedicated to eye and vision care at Zuckerberg San Francisco General since the 1980s, Jim began as a technician in the clinic and has played a key role in preserving and restoring the sight of thousands of patients over the years. During the HIV/AIDS epidemic, Jim was a stabilizing force of compassionate care of the epicenter of the Cytomegalovirus retinitis outbreak that caused blindness for many patients. Later, Jim was the leader and driving force behind the hospital's eye care outreach program, the Eye Van, bringing vision services to patients throughout the City who are unable to travel to Zuckerberg San Francisco General for care. Because of Jim's efforts, the Eye Van is a successful example of a public health program that delivers specialty care services to the community. Jim constantly seeks out patients who might be having difficulties in order to personally resolve any issues and ensure they have an optimal experience. As supervisor of the clinic in the Department of Ophthalmology, Jim leads by example, mentoring and training numerous clinic staff that all develop an impressive cohesiveness and team spirit under his guidance. Images featured in printed program during event. On locations images were presented on interactive screens at AT&T field while each Heroes was introduced, spoke and recieved their award. 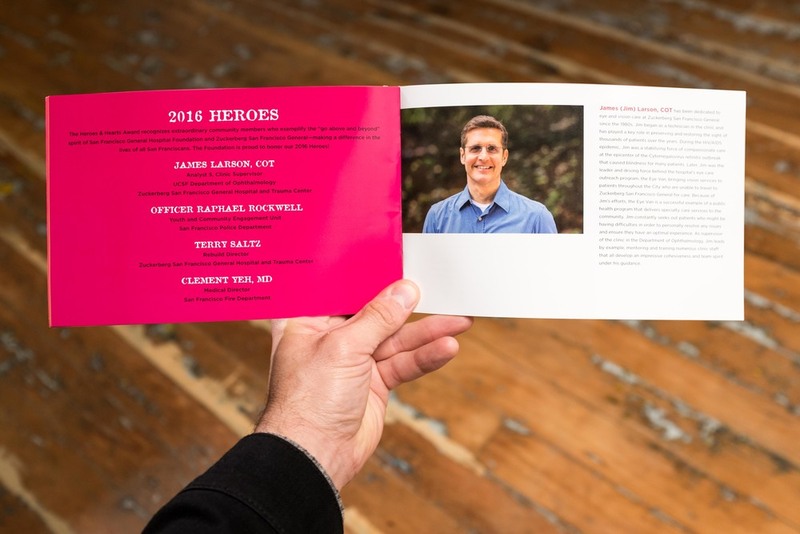 Copy Source: Heros & Hearts Benefit Luncheon's Event Presentation & Printed Program, San Francisco General Hospital Foundations.